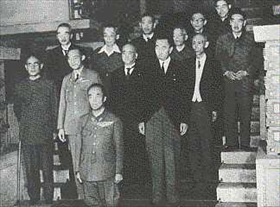 TŌJŌ TO REPLACE JAPANESE P.M. KONOE? On this date in 1941 Prince Fumimaro Konoe resigned as prime minis­ter of Japan. Konoe had lost the sup­port of cabi­net and Army minis­ter Gen. Hideki Tōjō, who called for a firmer line with the admin­is­tra­tion of Presi­dent Franklin D. Roose­velt over the U.S. ban on the export of scrap metal and the total em­bargo of oil and gaso­line exports to Japan. Over 80 per­cent of the island nation’s petro­leum needs were met through Amer­i­can im­ports, and the squeeze mea­sures reflected U.S. dis­gust with the aggres­sive ex­pan­sion of Japan into China and South­east Asia. The month before, on Septem­ber 6, the Im­perial Con­fer­ence (Gozen Kaigi), a body of civil­ian and mili­tary leaders who met with Emperor Hiro­hito (post­humously referred to as Emperor Shōwa) to ob­tain final approval for spe­cif­ic courses of action, had fixed an early Octo­ber dead­line for diplo­ma­tically resolving the Japa­nese-Amer­i­can crisis. If nego­ti­a­tions proved un­satis­fac­tory by mid-October, Japan would com­mence hos­til­i­ties against the United States, the Nether­lands, and Great Brit­ain, all states with sub­stan­tial terri­torial and mineral holdings in Japan’s over­seas back­yard. On Octo­ber 14, the dead­line came and went. Prime Minis­ter Konoe’s olive branch to Wash­ing­ton—with­drawing Japa­nese troops from China to im­prove rela­tions—split his cabi­net down the civil­ian-mili­tary fault line. Tōjō argued in favor of vastly ex­panding the grueling war with China—the Second Sino-Japa­nese War, which Japan had launched in mid-1937. He pos­tu­lated that a with­drawal from con­quered Chinese terri­tory and the Japa­nese pro­tec­tor­ate of French Indo­china, de­clared on July 25, 1941, to Roose­velt’s enor­mous cha­grin, would un­do the gains of the past four years and en­danger Japa­nese con­trol of its Man­chu­rian pup­pet state, Man­chu­kuo (seized in 1931), and its Korean pro­tec­tor­ate (declared in 1910). The next day, Octo­ber 17, Tōjō assumed the post of prime minis­ter at the head of a thor­oughly mili­tary-domi­nated govern­ment. Early the next month, on Novem­ber 3, U.S. Am­bas­sador to Tokyo Joseph Grew cabled Wash­ing­ton that Japan “might resort with dan­ger­ous and drama­tic sudden­ness to mea­sures that might make inevi­ta­ble war with the United States.” That same day Japan’s mili­tary com­mand, with Hiro­hito’s con­sent, approved Adm. Isoroku Yama­moto’s planned attack on the U.S. naval base at Pearl Harbor, Hawaii. Left: Cabinet ministers in Fumimaro Konoe’s second cabi­net (July 22, 1940, to Octo­ber 18, 1941). 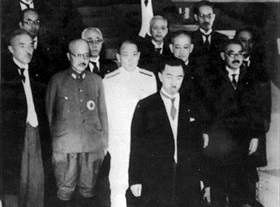 In this photo taken on inaugura­tion day, war minis­ter and future prime minis­ter Gen. Hideki Tōjō (1884–1948) is second from left in the second row. Konoe resigned seven weeks before the attack on Pearl Harbor when he lost the poli­tical sup­port of both the army and navy ser­vice branches in their head­long rush to war with the U.S., Great Britain, and the Netherlands. 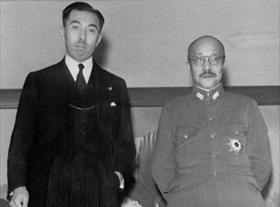 Right: On July 22, 1940, Tōjō was appointed Army minis­ter in the second Konoe cabi­net and remained in that post in the third (back-to-back) Konoe cabi­net. Years earlier, between 1932 and 1934, the scrawny, owlish Tōjō had com­manded the Kwan­tung Army, the largest and most pres­tigious com­mand in the Imperial Japa­nese Army. The army was largely respon­si­ble for the crea­tion of the Japa­nese pup­pet state of Man­chu­kuo in north­east China. Poli­tically, Tōjō was a fascist, nation­alist, and mili­tarist, and was nick­named “Razor” for his rep­u­ta­tion for a sharp, legalistic mind capable of making quick decisions. Left: As prime minister in the lead-up to Japan entering World War II, Konoe also played a role in the lead-up to Prime Minis­ter Tōjō’s resignation in July 1944, after the Amer­i­cans cap­tured the island of Sai­pan in the Mari­anas. The next year Konoe served in the first post­war cabi­net of Prince Naruhiko Higashi­kuni (shown here in this news­paper photo­graph) from August 17 to Octo­ber 9, 1945. Konoe is the fourth person on the right in the second row. 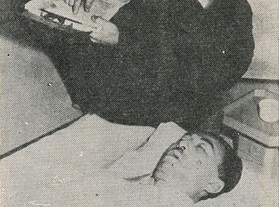 Right: A coroner from the American occu­pa­tion force in Japan per­forms a post­mortem on Konoe on Decem­ber 17, 1945. Konoe had refused to col­labo­rate with Gen. Douglas Mac­Arthur and the Amer­i­can occupa­tion force in their efforts (Opera­tion Black­list) to exon­er­ate Em­peror Hiro­hito and the im­perial family of crimi­nal respon­si­bility leading up to and during the Asia Pacific War. Konoe thus came under sus­pi­cion of war crimes himself. In Decem­ber 1945, during the last call by U.S. autho­ri­ties for alleged war crimi­nals to turn them­selves in, he committed suicide on December 16, 1945.